Oil shale and tar sands remains a speculative industry in the arid lands of the Colorado Plateau. A general lack of water is why the industry will never be viable. Even if alternative chemical washes are used to separate bitumen from sand, for example, it still requires 1.5 to 2 barrels of water to refine a single barrel of synthetic crude. What this extraction will accomplish is physical damage to the Colorado River watershed, which supplies culinary water to nearly 30 million people. It will also create more CO2 in the atmosphere, which is the #1 killer of the Rocky Mountain snowpack, which provides 85% of the Colorado River's total annual water supply. Our watershed needs investors to create a reliable energy supply that will heal the water supply of the Colorado River, not destroy it. Click here to send a message to the Department of Water Quality about proposed strip mining operations by Red Leaf Resources in the Uinta Basin. Independent Technical Memorandum: Greenhouse Gas & Water Footprints of Oil Shale & Tar Sands Resources & Projects in the Upper Colorado River Basin. 2018, EcoShift. The Executive Summary of this report is HERE. Notice of Intent (NOI) to Commence Large Mining Operations. Red Leaf Resources. November 2011 - Red Leaf NOI Protest. Living Rivers and Western Resource Advocates. February 2012 - Notice of informal hearing for Red Leaf Resources. February 2012 transcript of Red Leaf hearing. Video about Red Leaf. EcoFLight. 1967 - Northcutt Ely's Water Budget for Oil Shale Production. 1967 - 4th symposium on oil shale. Colorado School of Mines. 1974 - Oil Shale Development. League of Women Voters. Oil shale library. Headwaters Institute. 2010 - Policy Analysis of Water Availibility and use Issues for Domestic Oil Shale and Oil Sands Development. Univ. or Utah. 2014 - Drilling Deeper: A Reality Check on US Government Forecasts for a Lasting Tight Oil & Shale Gas Boom. Hughes. 2013 - Executive Summary: Tar Sands Oil Shale Market Assessment. U of U. 2013 - Oil Shale Market Assessment. U of U. 2012 - Investor Oil Shale Risks. CERES. 2011 - Economic Impact of Marcellus Shale Gas. Cornell. 2011 - Marcellus Shale: What Are The Limitations? Cornell. 2010 - Oil Shale: 14 Unanswered Questions. Headwater Economics. 2008 - North American Oil Sands History Development Prospects. Congressional Research Service. 2008 - Developments In Oil Shale. Congressional Research Service. 2007 - Testimonies Oil Shale. RAND. 2005 - Oil Shale Development USA. RAND. Critical Habitat Map. The Wilderness Society. Graham's beardtongue. Salt Lake Tribune. Oil Shale and Tar Sands web page. Utah Geologic Survey. Tar Sands Bibliography (2009). UGS. 2008 - Oil shale and tar sands Programmatic EIS. BLM. 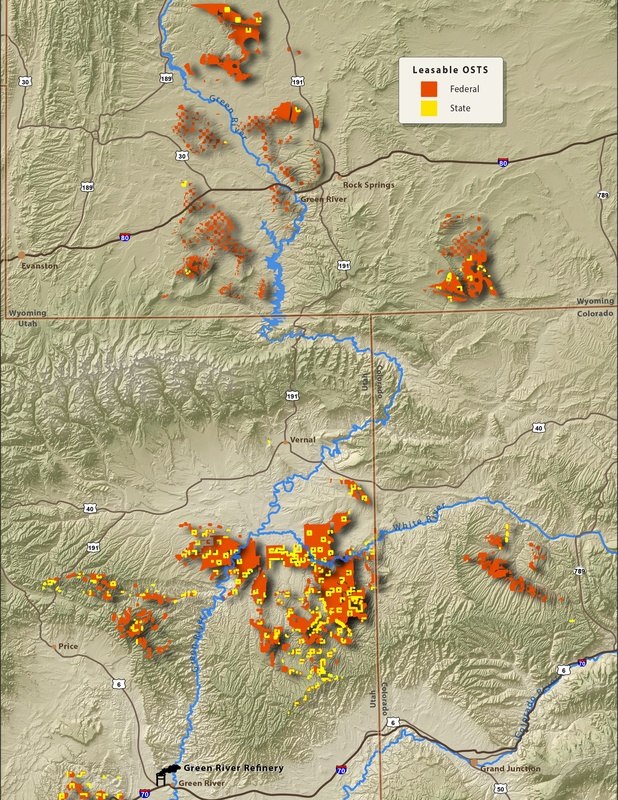 2008 - Holocene Debris Flows on the Colorado Plateau. Webb. 2007 - Analysis of Utah Tar Sands. UGS. 1992 - Hydrocarbons along proposed Book Cliffs Highway. UGS. 1975 - Mineral Resources of Uintah Ouray Reservation. USGS. 6/15/10 - Wildflower vs. Oil Shale. Salt Lake Weekly. 9/17/2007 - Tar sands, oil shale. Energy Bulletin. 3/24/10 - Decision on wildflower protection expected soon. Assoc. Press. 3/29/10 - Sage Grouse will play role in Western energy development.Marten Law. CERES Report on Oil Shale/Water Nexus. Tar Sands: Feling the climate crisis. FOE Europe. White Paper. Utah Mining Association. 1995 - Surface disturbances and the role of accelerating erosion. Belnap. PR Springs water right 01 and 02. Utah Division of Water Rights. 2009 - Bibliography of tar sand deposits & map. Utah Geological Survey. 2009 - Approval of PR Springs strip mine for tar sand. UDOGM. 2010 - Notice regarding PR Springs Mine to Grand County Council. UDOGM. Fossil Foolishness. Western Resource Advocates.